photo credit: Edgar Zuniga Jr.
Last night was the council meeting about where the Bus Rapid Transit (BRT) was going to be placed in Provo. 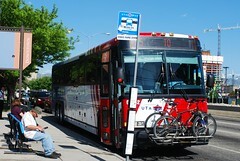 The BRT is a bus line that will run from Provo to Orem and connect the Front Runner stations that will be operating within the next two years. The decision that was made last night was whether this bus line was going to go on University Ave. or Freedom Blvd. The council voted 6-1 for the line to go on University Ave. You may be asking yourself what this has to do with bicycles? If you follow this website or the Provo Bicycle Committee Facebook you will know that in the projected plan that was presented to Provo City bicycles were not going to be an option on University Ave. once they completed the BRT. With this in mind the Bicycle Committee got people together to ride to the meeting and make sure that cyclists voices were heard. We (cyclists) had a showing of about 16 people at the meeting. About 5 of those 16 stood up and spoke to the council about the need for cycle lanes on University if there was going to be a BRT. Some members of the Provo Bicycle Committee (Tod Robbins and myself) stood up first to present the statement that was previously prepared and to help dispel what seems to be the biggest fear for this project, that bicycle lanes will take away on street parking. Everyone that spoke did an awesome job and, in my opinion, really let the council know that there are many cyclists/citizens in this city who want good safe bicycle lanes as well as livable communities. After most of the bicycle advocates presented their cases many business owners stood to express their concerns about which road the BRT would be placed on. Almost every single one of the business owners who expressed their concerns also spoke up for the need of more bicycle lanes. This includes the General Manager of Provo Marriott Hotel who actually said “There should be a bike lane on 9th (9th East), University, and Freedom because we need more bike lanes.” The support also included one business owner who gave my favorite quote of the night, “If I were a politician I would be buying a bicycle.” It was really neat to see cyclists and non-cyclists working towards a mutual goal. Once public opinion was done UTA came forward to present their plan and desire to set up on University Avenue. There were many questions about the project that were non-cycling related. They had to do with why University was better than Freedom. On the cycling front we really saw two champions step forward from the City Council: Sterling Beck and Steve Turley. We at BikeProvo know that Sterling Beck is for cycling and seeing cycling thrive in Provo. He has made that evident by his support of cycling events and organization in Provo as well as by his comments last night to make sure bicycles have a spot in this project. In the meeting Steve Turley also pointed out that it was entirely possible to have parking, bike lanes, and green space, based on the measurements that were given by UTA and the suggestions made by the Bicycle Committee. Hopefully we can see more bicycle acknowledgment from Councilman Turley in the future. All and all this meeting was a good step in the right direction. But, there is a lot more work to do. Now that UTA has the green light they are going to move forward and do final engineering that will include block by block analysis of what will work were and what may have to be sacrificed for what. We as the cycling community need to make sure that bicycles do not fall by the wayside. We need to contact our council members and let them know that bicyclists/citizens want these lanes to exist and want Provo to keep striving towards livable communities. Often we talk about the need for change or the desire to make a difference. This is our chance to effect change and make a difference; this is our chance to set a precedent. Let’s not let it pass us by. In closing, I want to give a big thanks to everyone who has showed their support so far and for all those who were able to make it to the meeting – thank you. 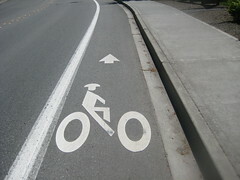 This entry was posted in Bike Advocacy, Bike Paths, Bikes in the News, Provo Bike Committee by Zac. Bookmark the permalink. I was so happy to see such a diverse group of bike advocates at the meeting. Parents, students, homeowners, renters, business-owners, and even non-riders came out to show support. Everyone did an amazing job!